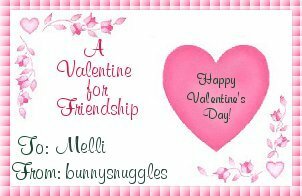 This is Snuggles Bunny, my RAOK secret valentine, and all week long she (or he -- oh I hope not! In that hat?) has been sending me the most darling little gifts and cards! 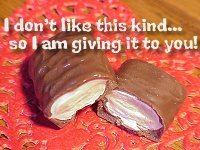 I would like to share them with you -- cuz I am one spOiled little girl! 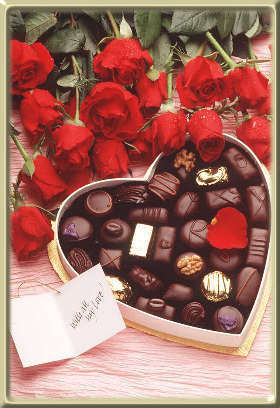 and a big ol' box of chocolates!!! Did I mention I love bears??? I got another one!!! As a matter of fact... I got two! And a card with this adorable little guy on it!!! Oh, I just love him! Oh! Sorry... This little bear! I can't link him to the card site... cuz it's a private on... just for RAOK members. 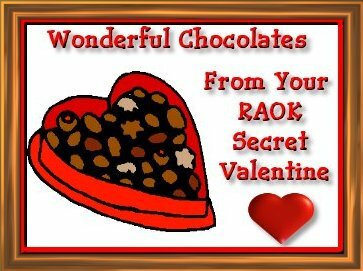 But... if you wanna join RAOK (random acts of kindness) click him and he'll show ya what to do! And a Cookie... from Granma Hugs! My favorite! 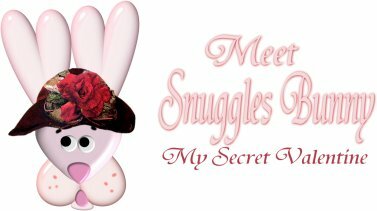 Day Four Oh Snuggles Bunny was a Bizzy Little Bunny today!!! I started my morning off with a Love Quiz!!! Spitting & sputtering over red undies or leather while I drank my coffee! LOL! Then I got this darling little she-bear in the mail! I really love this little bear! A little while later I received this Heart Throb in the mail. And... then another interactive card too! 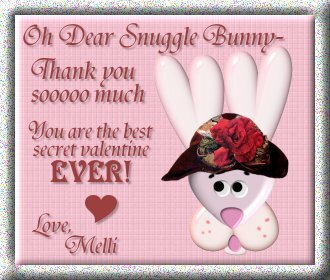 Snuggles Bunny ... YOU'RE the BEST!!! Yummy! More Cookies from Gramma Hugs Bake Shop! If you'd like some, she makes them hot and fresh daily! I believe I am quite spoiled! Well, SB sent me these two little dolls to keep me company! And this darling little shadow box! (almost looks like a "home" for the little girls! LOL! She sent me to her home page where I had a wonderful visit with she, her handsome hubby, and her adorable little boy! They told me their "Cinderella" love story! Angiee, Thank You sooooooo Much!!! You have made my week so wonderful! 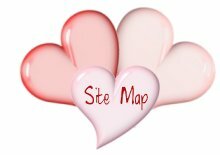 Now, if you would like to see the gifts I've received from other friends around the web, click the hearts below!